“Oh hell,” I muttered. 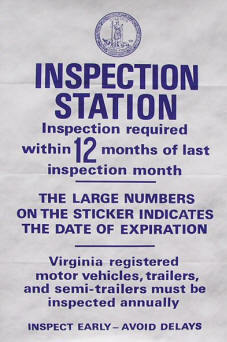 My inspection sticker expired at the end of the day. I called Joey Kaylor at Protocol Automotive. After giving me an expected ration of grief for waiting until the last day for an inspection he said he could take the Jeep in about 30 minutes. With a new passenger side windshield wiper in place and “12” and “10” on the windshield, I cruised back onto U.S. 221 to take care of the rest of the business of the day. At the Floyd County Rescue Squad’s Station #1, a State Trooper pointed out that the inspection sticker on one of the ambulances also expired at the end of the day. A quick trip to Protocol late in the afternoon corrected what could have been an embarrassing situation for the squad. One of these days I’m going to do something about my bad habit of procrastination — just as soon as I get around to it. Proof that the Floyd county way is still in effect, eh?